The bus pass allows travelers to travel in one direction, either north or south, along the coast, stopping off at any of the several stops offered via Greyhound. Greyhound makes booking easy with the option to confirm your seats online. I made our itinerary about three weeks prior to departure and had booked our seats for each leg of the journey as well. I prefer to know where I’m going ahead of time and allow for some flexibility during the travels. We’ve been on the road for just over a week now and I’ve already changed our itinerary twice based on local recommendations and timing options. I’m breaking up the journey with highlights of places to see and things to do along the road from Sydney to Brisbane. I’ll continue to post about the journey as we go but here’s what we’ve accomplished so far. I love this city. 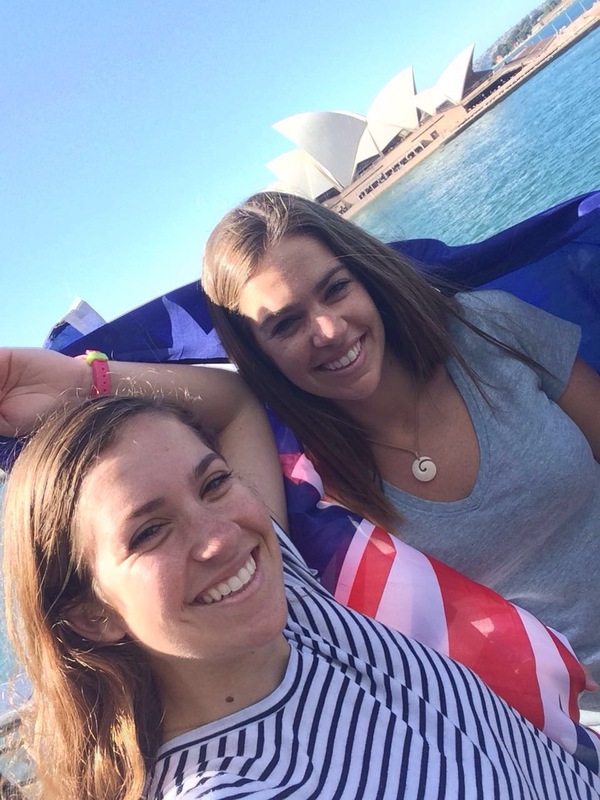 After traveling around much of Australia for 3 months, I was excited to not only be back in Sydney but also to show my sister around all of the city’s iconic spots. We spent a brief 2 days here and will have a bit more time back in the city at the end of our adventure. My past post – Love Letter to Sydney – details all the best things to do but for this short stay we hit up the top sites including: The Opera House and Harbour Bridge, The Opera Bar, Royal Botanic Gardens, Darling Harbour, Newtown, Surry Hills, Bondi to Coogee Coastal Walk, Bondi Beach, and Coogee Pavilion. Needless to say, we were ready for our 10-hour overnight bus trip by the end of the two days! Yamba is a small surf community tucked into New South Wale’s north coast. 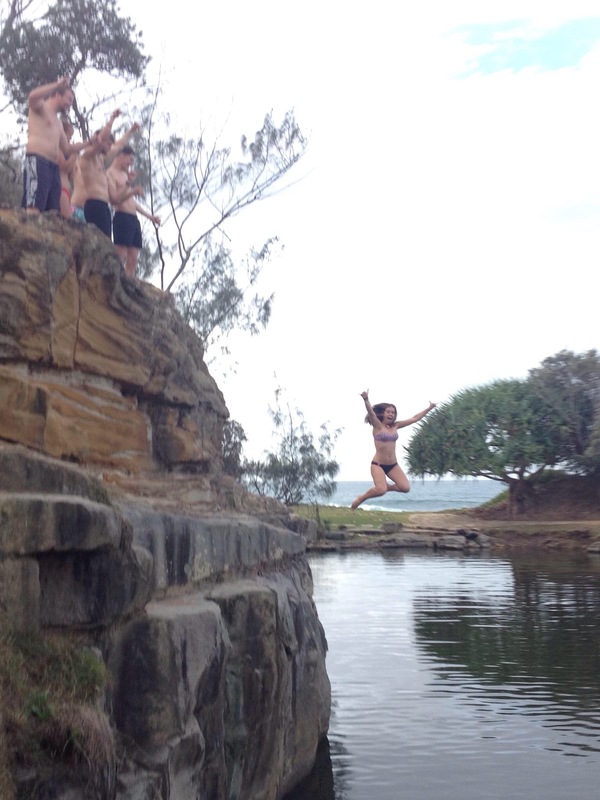 While planning my East Coast Adventure, I’d heard one person mention Yamba as a great place to check out. Yamba is a surfer’s paradise and home to Mr. Billabong himself. It is also home to several epic surf breaks and protected parks resulting in the fact that, while it’s often photographed, it cannot be named. This lack of direct publicity keeps the crowds away. Yamba is most commonly found through word of mouth. My sister and I stayed in Yamba for one night and, not being passionate surfers ourselves, felt we had sufficient time there. The best thing we did was opting to pay $15 for Shane’s Tour via the YHA hostel. Shane is one of the owners and to say he is a character is putting it lightly. Upon introduction, Shane shares that he is ADHD and has been banned from drinking Red Bull before his tours. As we are about to leave, he tells our group that he is waiting on his coffee (with 6 extra shots!) and shows us that he snuck a bottle of Red Bull into the van as well. At this, we all exchange looks of slight concern. The last thing this naturally energetic man needs is more caffeine! It was quite a way to start a tour. Over the course of the next four hours, Shane shares an important motto with our group: “What happens on Shane’s tour, stays on Shane’s tour.” Because of this, I won’t reveal much else but I will say that it was one of the most fun tours I’ve been on and I left feeling exhausted and energized at the same time. One secret from the tour that I will reveal is our opportunity to cliff dive into the Blue Pools. A definite must-do, even if you are crazy enough not to do this tour! Honestly, there isn’t much else going on in Yamba and most backpackers arrive ready to sign their names on the list for this incredibly hyped tour. Word of mouth is a powerful tool. A few other Yamba notables include options for surf lessons, stand up paddle boarding, kayak rentals, and $10 dinners at the YHA. Several people in the hostel were long-termers because of the easy-going surfer lifestyle but, like I said, if you’re not looking to fill your days with surfing, one or two nights will be more than enough for Yamba. Byron is where I learned to surf…and by “learned” I mean took my first lessons. I booked a three-hour lesson with Black Dog Surf School and headed out to The Pass one cloudy afternoon to begin. While the overcast kept the bathers away, it was the perfect setting for our lesson with a beautiful hazy sky as the backdrop and hardly any other surfers fighting for the same wave. Our lesson included myself, my sister, and three other newbies, all ready to try. After failing the first go-around, I was up by the second and practicing my balance on the oversized board. 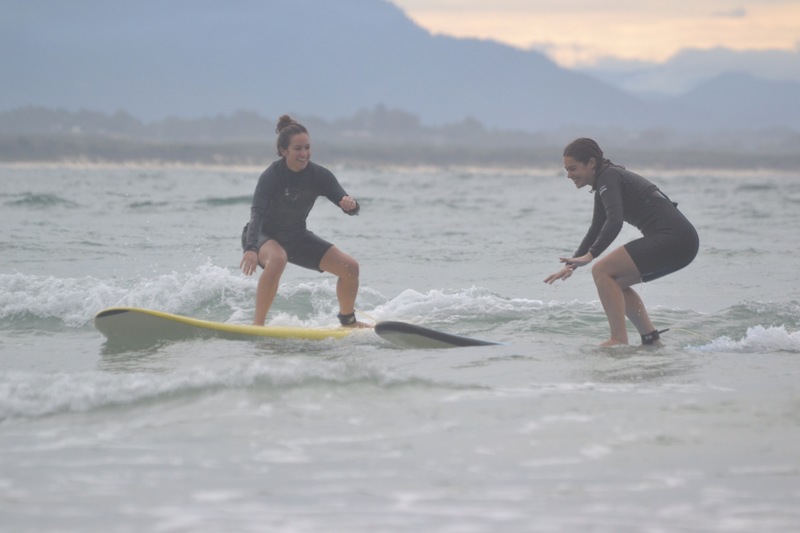 Because of our small group size, we had several opportunities to flex our surfing skills and wrapped with our instructor gently forcing us to catch our own waves rather than being pushed into them. It was a memorable afternoon! My sister and I ventured into a joint called The Cheeky Monkey in search of a free drink, courtesy of our hostel. I was immediately transported back to my college days with a cover charge, loud music, shirtless male bartenders, and tabletop dancing. Yes, I am getting old. We finished our free glasses of sparkling and quickly moved on. One of the best parts of Byron is the nightlife options. Not into the club scene? The hotel bar down the street has a live rock band tonight. Want more of a lounge space? Byron has that too! There seemed to be something for everyone. In addition to the surf, Byron Bay is also known for it’s iconic lighthouse strategically placed on Cape Byron. A 45-minute walk along a boardwalk and past several beautiful beach coves leads you to the most easterly point of Australia and the home of the Cape Byron lighthouse. Make the trek just before sunset to enjoy the 360-degree views of the bay, Pacific, and surrounds as well as the pink and purple hues of the setting sun. Crossing the state border into Queensland (I’ve now visited 7 out of 7 states! 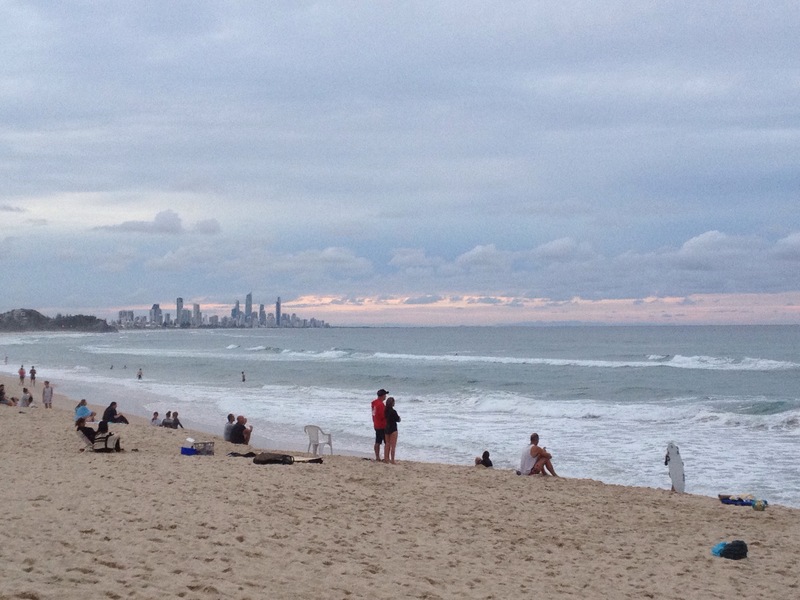 ), our first stop is Surfer’s Paradise. Located on the Gold Coast, Surfer’s Paradise, or Surfer’s for short, is a flashy stretch of beaches lined with high rises and water-side shopping malls. Upon first view, I turned to my sister and said, “Where are we? This doesn’t look like Australia”. The vibe reminded me a lot of South Florida with all of its toned bodies and greased up styles. While it may feel like a different world to some, Surfer’s is another great spot for surfing, beach-going, and coastal walks; all perks of Australia I’ve grown to love. The main beach at Surfer’s is a bit of a tourist trap. Skip it and head just south to Burleigh Beach. There are great fish & chips to be had, walk and bike paths, less crowds, and killer views of the Surfer city skyline. Just beyond the beach lies a headland walk shaded by mangrove trees. There are multiple paths to choose from with a loop option and several lookouts over the ocean. The walk takes about an hour or so to complete and is likely to be followed up by a jump into the cool blue ocean below. Step One: See it all at once! Bum a ride, ride a bike, or jump on the bus up to the lookout point on Mt Coot-Tha. These views offer a 360-degree look at the city, surrounding mountains, neighboring towns, and the Pacific Ocean. It’s the best way to start (or end) a visit and would likely be even better at sunrise! I didn’t bother waking up that early during my short stay but imagine it would be worth the early alarm. The sun rises in the East, remember?! With such a quick visit, I took advantage of any opportunity to see as much of the city as possible; Eleven Rooftop Bar offered me just this. A relaxing lounge-type bar with excellent city views make this rooftop spot a must-see. Brisbane has a few key rooftops worth visiting but this is the only one I enjoyed. I’m glad I did. Home of the Instagram-famous “Brisbane” sign, South Bank is the place to be. 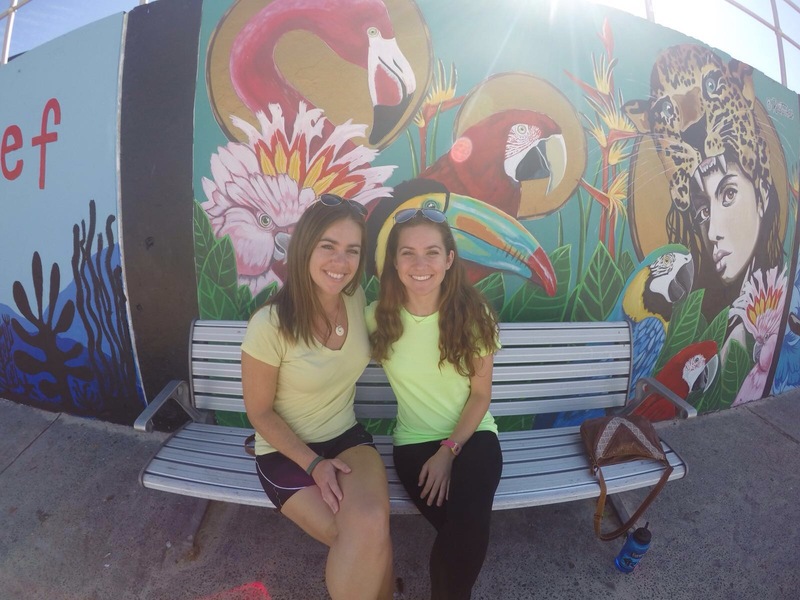 It offers a variety of bars and restaurants as well as pools, a man-made beach, and great city views. Located across the river from downtown, South Bank can be enjoyed both day and night. I do not typically visit zoos because they often feel depressing to me. I hate seeing animals pacing around small spaces with minimal resemblance of their natural habitats but when I realized the Australia Zoo was Steve Irwin’s zoo, I knew it would be worth the visit. We spent the entire day at the 100-acre Zoo, enjoying the animal shows, encounters, and amazingly natural spaces. The Zoo itself is located amid a mountain range and jungle, making the zoo even more accommodating for its animal inhabitants. The Zoo offers guests opportunities to get up-close with many of the native Australian animals including koalas, kangaroos, wombats, and snakes. I chose to hold a koala and was surprised by both its heavy weight and soft fur. 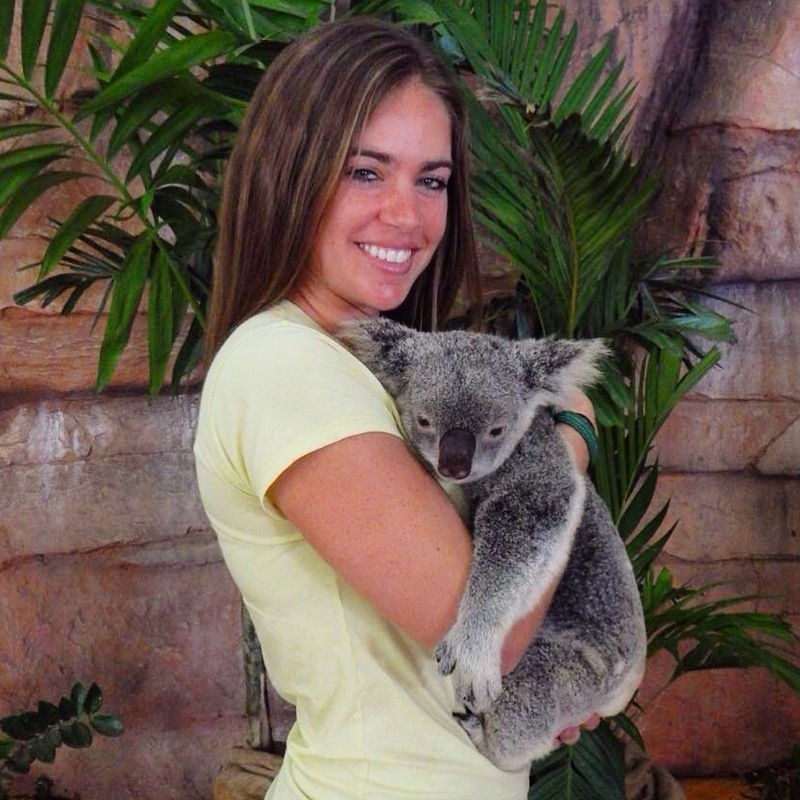 My koala moment was my favorite of the visit, although I really loved the entire day. I was so impressed by the obvious care taken with the animals as well as how happy the staff appeared. It was an awesome visit both honoring Steve Irwin’s memory and contributing to wildlife conservation – one I would be happy to do again. The next stretch of the trip takes us from Brisbane to Cairns with several overnight tours planned along the way. Check out my posts about the rest of my trip including Fraser Island and Whitsundays trips as well as snorkeling the Great Barrier Reef and a visit to the Atherton Tablelands! Enjoyed the read! Grateful to explore through your eyes. You and Beth look so happy in the opening picture. I love and miss you two. Enjoy! God bless you both!